*The product is presented in this video Lightroom Classic CC, previously known as Lightroom CC. For more information, please visit: https://adobe.ly/2gNcw59. 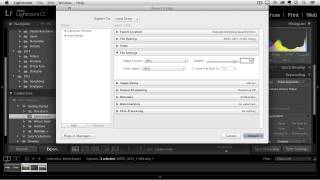 You quickly learn how to export large quantities of images in Lightroom. Are you kidding?! Believe me when I say – after years of working with LR – I HAD NO IDEA (foolishly, I guess) UNTIL RIGHT NOW that you are supposed to go initially from Library > to Develop > then BACK to Library! What?! Honestly, I thought it was a step-wise process, Open Lightroom, tag and select what you want to work on in the LIBRARY module, THEN go to the DEVELOP module as step two, then export your pictures from the Develop module. I have never seen anything, nor did I or my career photographer wife, know you are supposed to return to the Library module after doing your changes in the Develop module. Stunned is an understatement. I have never seen any instruction that states clearly that your originals are no longer in the Library, but your changes are there now. We have completely misunderstood that little fact. Please feel free to laugh, but I just can’t believe how this was missed for years. Wow – do we feel DUMB! Thanks! Most of these tutorials cater to photographers who have "clients" not hobbyists. She suggests not keeping a copy of what you export which is exactly what I don’t want to do, erase something after its been edited. Looking for some sizing help. I sell my clients digital negatives they all get printable up to 4×6 and the option to invest in printable up to 8×10 or printable up to any size. My guess is that they will go to Costco to make prints so I have been running test and printing them at Costco. I have tried changing the DPI, Pixel count, quality but no matter what I do they all look great up to a 11×14 I have not tried printing bigger. So in short for the 4×6 files I want them to break up when trying to print larger then 4×6. For the 8×10 files I want them to break up when trying to print larger then 8×10. I’m shooting with a Nikon D800 as well. Any help would be great. Thank you. I have issues with exporting DNG files to upload to Dropbox for a client I did some editing for. Yet after exporting as DNG the image that uploads to DropBox is actually the image before editing. Am I doing something wrong? i want to ask for the image size you do…its compatible in facebook? What happens if we export from the develop module. Thats how ive been doing it all along. I have problem in exporting images. sometimes it shows error because of memory but i do have enough space for images. what should i do? Great tutorial! Thanks for the priceless information! Thank you! Great video and easy directions! Thanks for the video, but I am having a MADDENING experience exporting the images I have worked so hard to edit in the Develop Module: The CHANGES I worked so hard to do are not being exported, no matter what I do; LR simply exports the the files I started with. These happen to be DNG files and I have asked that they remain DNG files (I am selecting DNG as file type, not the "Original" button). Why isn’t Lightroom not simply SAVING/EXPORTING my edits?? Main purpose of Lightroom CC, No? Great tutorial. I really appreciate it and please keep them coming. Again, thank you very much! Is there way to search for all photos which are not exported so far? This solved the mystery as to why my photos were blurry after exporting. I just changed the "Standard" to "High" setting in the "Output Sharpening" tab. The difference is magnificent! Thank you kindly, Julianne. I have a problem, no matter what I do, the image after exporting is always terrible looking quality, very pixelated, than how it looks in Lightroom. Please help.